FSC® 100% certified hardwoods TONKA and GARAPA finding favour with specifiers and the construction industry alike. Rosenfeld Kidson has recently supplied timber to a number of high profile projects further enhancing Auckland’s spectacular waterfront. TONKA has become the hardwood timber of choice for public space developments in applications such as boardwalks, wharfs, bridges and other structural end uses; as well as heavy exterior furniture, shelters and residentially for pergolas and posts etc. In addition to its environmental credentials, it is favoured for its superior characteristics of strength and durability, its attractive colour and great weathering properties. Below images show the newly completed Devonport Wharf and Marine Square project. A legacy North Shore project, this major infrastructural upgrade was delivered jointly by Auckland Council and Auckland Transport. Taken together with the new library, also clad in Western Red Cedar supplied by Rosenfeld Kidson, this represents the most significant Council investment in Devonport for a very long time. FSC 100% certified timbers supplied to the project include Tonka for the boardwalk material, Iroko used as the handrail and Massa seating. 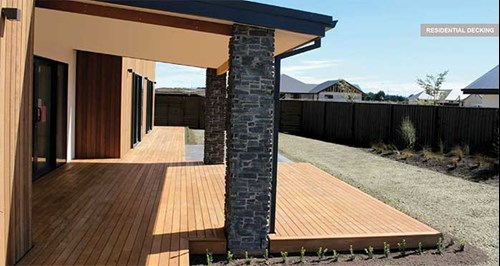 GARAPA is becoming the preferred hardwood timber choice for smaller dimension applications such as exterior furniture and joinery, public boardwalks and domestic decking. It has all the benefits of a stable and durable hardwood, with the added features of being from an environmentally responsible source and having negligible tannin release. GARAPA is an attractive honey-brown colour and has a fine texture that weathers very well and is not prone to checking/splitting. PEFC certified AUSTRALIAN hardwoods have also made a resurgence, being specified for a number of large local body projects in Auckland. These include SPOTTED GUM supplied by Rosenfeld Kidson to the Westhaven Promenade project and JARRAH for another large downtown project being completed towards the end of the year. Rosenfeld Kidson & Co. Ltd is a specialist timber merchant and importer, incorporated in 1930. We stock New Zealand’s largest range of over fifty species, both imported and locally grown and are the only importer to offer a full and comprehensive range of FSC 100% certified hardwoods. We distribute to the construction industry, joiners, furniture manufacturers, cabinetmakers, boatbuilders and flooring contractors throughout New Zealand, primarily via selected reseller merchants from our sales and warehousing facilities based in Auckland and Christchurch. 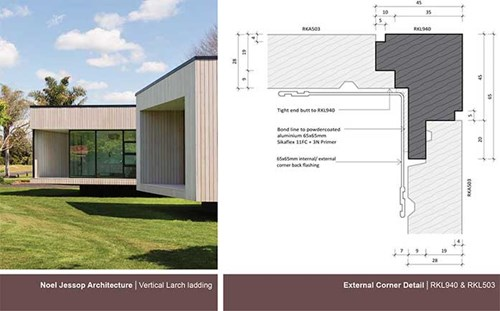 Larch cladding is now available in our Vertical, Rusticated, Bevel Back and Board and Batten cladding systems. Customised corner and jamb detailing have been developed to effortlessly blend with our range of 28mm thickness Vertical and new Rusticated weatherboards. Larch has a very pale appearance with a strong grain pattern and tight knots. The extreme climate from which Larch originates produces slow growing conditions, resulting in close growth rings and a fine grain. Larch also possesses a high resin content and coupled with its naturally high density has great durability properties. These characteristics produce a timber of great depth and texture that is a unique alternative to other timber claddings in the market. Factory oiling in a our ‘Larch-specific’ range of Dryden Woodmaster blondes and silver greys further compliment this distinctive material. 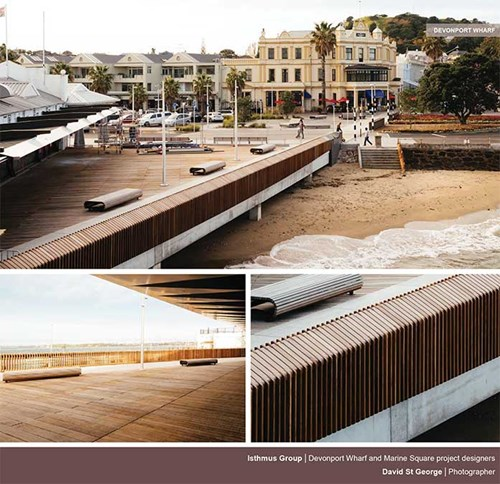 Rosenfeld Kidson recently supplied 200x75mm Tonka structural wharf decking for the Devonport Wharf upgrade. In addition to its environmental credentials, Tonka is favoured for its superior characteristics of strength and durability and also its attractive colour and weathering properties. In addition, FSC 100% certified Iroko was used for the feature handrail and Massa for the street furniture. Follow this link to read an article on this project from the landscape architect involved Isthmus Group. The Longbush Ecosanctuary Welcome Shelter is an innovative environmental education space designed as a gateway for visitors to a very special environment, which includes several critically endangered native species. The ecosanctuary is approximately 120 hectares and over the past 15 years has been the rapidly restored through the efforts of Jeremy and Dame Anne Salmond. Constructed by a team of passionate volunteers from donated materials, including timber flooring from Rosenfeld Kidson, the Welcome Shelter utilises very simple construction techniques. The aim of the shelter is to use minimal architectural resources while promoting active stewardship of our natural environment. The Welcome Shelter facilities are free of charge for all visitors, including school groups, ecologists and tourists. Rosenfeld Kidson were proud to have the opportunity to provide Australian solid hardwood flooring for the Welcome Shelter, as we found the project intent was in line with our business values. 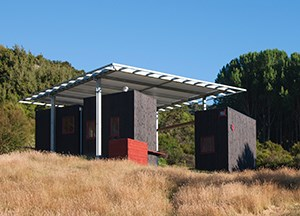 The design of the structure draws on the framing techniques of the picturesque, but applies these through contemporary forms, which promote active engagement with the environment. Rather than simply viewing the landscape, visitors are encouraged to take part in the environmental restoration occurring at the ecosanctuary, through the programs offered at the Welcome Shelter. A large steel and fabric canopy provides shelter from the sun and rain for an outdoor classroom created on the hillside. Below the roof the form of this classroom is defined by the position of three timber enclosures and small retained gardens. The design plays with the connotations of natural and synthetic materials in the setting of the recovering environment. Each timber enclosure provides a different service, including the storage of teaching material, ablution facilities and an office for the site ecologist. This office opens up to the exterior with a large drawbridge to create a level platform on teaching and demonstration days. Another enclosure includes a roof deck from which a stunning view of the valley can be appreciated. This deck is accessed via a traditionally made greenwood ladder, made from a Manuka tree harvested from the building site. With the removal of invasive pests and weeds, alongside the planting of hundreds of thousands of native trees, the diverse ecology at Longbush is beginning to thrive again. Never before in New Zealand history has such a large and diverse group of volunteers and sponsors created a piece of public architecture. The Welcome Shelter creates a new benchmark for high quality, community generated, architecture that responds to the needs of the local environment. All photos courtesy of Sarosh Mulla. This contemporary suburban home designed and built by multi-award winning Cameron Ireland Builders, with architect Jack McKinney, is one of several modern homes built on the site by Ireland. The garage and floating box are clad in black-stained vertical cedar weatherboards supplied by Rosenfeld Kidson together with Garapa hardwood decking and cedar fence palings. Western red cedar cladding blends Southland exterior aesthetics of high country resilience, and provides interior glow. Innovative new 45mm structural cavity system enables improved weather protection and ventilation while allowing more depth around windows for a clean exterior profile. FSC 100% certified Garapa hardwood decking timber marries perfectly with the chosen materials and surrounds. The Law house is a superb example of New Zealand architecture with cool clean lines and a breath-taking outlook over Lake Wanaka. Designed to complement and enhance the spectacular natural landscape, the Law House utilises its great location and aspect to maximise views and energy efficiency. Wide windows and decks on two sides provide a nearly continuous outlook and a feeling of being connected to the dramatic and spacious surroundings. "We have worked hard to ensure the building blends with the environment. The timber cladding is a very important component of this. The Rosenfeld Kidson corner and jamb profile is a beautiful way to detail these junctions. The window flashing system we developed has been refined to work with this and ensure the water protection, drainage, air seal and insulation all align as they should." For the house’s distinctive exterior cladding Koia Architects chose Western Red Cedar. Cedar has a very low shrinkage factor and therefore is very stable. "Many builders in Wanaka will only use cedar as their timber cladding. The climate has a very low humidity which causes significant shrinkage. It can cause damage to any antique furniture on the inside of a house and the exterior of a house is a much harsher environment." - Tony Koia. Western Red Cedar varies from dark brown to pink and readily accepts stains and oils to provide a wide choice of palette. Available in an endless variety of profiles, finishes and coating products, cedar provides designers and architects with great design flexibility. Western Red Cedar was also employed for internal panelling throughout the Law House. "We wanted to create a 'warm glow', reminiscent of a ski lodge, to the living room. In a bright large glazed area, cedar panelling absorbs the light and minimises glare. Using cedar for the interior has worked really well to link the exterior to the interior, and combine with the local schist and break up other flat painted surfaces. - Tony Koia. The 45mm structural cavity system utilises a structural 45mm Radiata cavity batten with vertical shiplap Cedar weatherboards. The ventilated cavity batten is fixed to the wall framing without requiring additional supporting dwangs or nogs meaning it is much easier to install. The primary benefit of a 45mm structural cavity system is that the cladding only needs to be fixed to the batten itself and not through the building envelope, helping to maintain the integrity of the air seal. The 45mm structural cavity also allows for improved drainage and ventilation. "With the 45mm structural cavity system, the exterior nails do not penetrate the RAB board lining, which means there is significantly reduced risk of water penetration and better pressure equalisation. There is less risk of water or air leakage, and the better ventilation provided by the system means better drying. Windows and doors can be recessed to the insulation and RAB board line to ensure these are a continuous line around the perimeter." - Tony Koia. The greater cavity space provided by the 45mm structural cavity system allowed the recessed windows in the Law House design to be brought forward to the outer line of the framing, rather than recessed behind it. Koia Architects specified Garapa for the striking deck of Law House. Garapa has a history of success in New Zealand, tried and tested in our country’s varied climatic conditions for almost a decade. Garapa is a honey brown colour with a very fine finish which appealed to Koia Architect’s Tony Koia on an aesthetic level. "I think the colour and grain of Garapa wood is better suited to Wanaka than most timbers, as it blends beautifully with the natural surroundings." - Tony Koia. Because Rosenfeld Kidson’s Garapa is a kiln-dried timber, it delivers great properties of stability in addition to its great durability. Garapa also does not suffer end-checking or leach staining tannins in the way some other hardwoods can. As well as having many superior properties compared to other hardwoods available on the market, Garapa is environmentally certified as FSC 100%, which is the most stringent third-party environmental standard available. "We had designed an outdoor bath which is hidden under a removable deck cover. This meant we needed a timber that wouldn’t leach into the bath, so we wanted an alternative to Kwila. We also wanted a more sustainable hardwood, and the colour of Garapa made it an attractive alternative." - Tony Koia. "It is essential to have a quality builder at any time and Tony Quirk Builders have been great. Their attention to detail has been particularly impressive in aligning the cedar sacking to the interior to the doorway openings; and it is this quality that is needed to create architecture." - Tony Koia. Koia Architects was established in Auckland, New Zealand in 1995 by architect, Tony Koia. The practice has expanded over the years and a second office was established in Queenstown in 2004. Each commission is special and unique. Every client brings a different hierarchy of requirements and Koia Architects identify these at the outset - whether they are aesthetic, quality, time or budget constraints - so a successful outcome is achieved. For more see www.koia.co.nz. 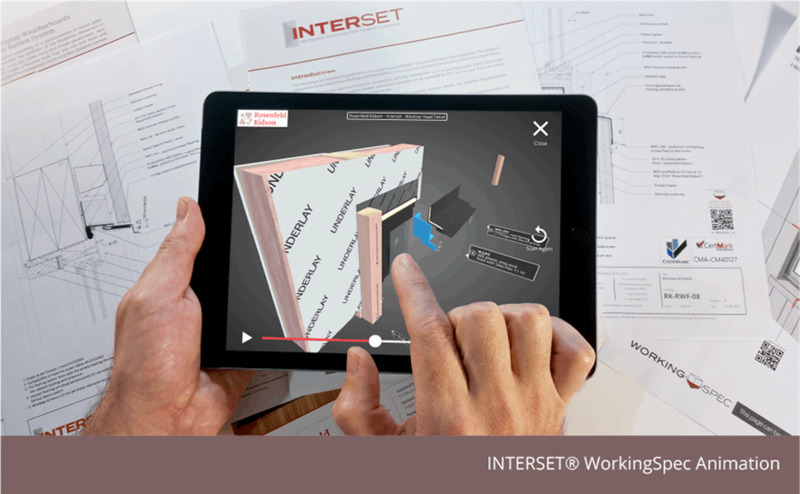 Rosenfeld Kidson’s INTERSET® Recessed Window Flashing System can now be viewed as an interactive 3D animation to assist interpretation and installation of this clever solution. Rosenfeld Kidson has the fortunate opportunity to be the first to embrace this revolutionary platform. WorkingSpec allows Manufacturers, Architects and Engineers to communicate their design details to the trades in a more accessible way. Often the existing information is platform and software specific and limits a user's ability to access the information easily. Many times, information contained in a detail is missed or not interpreted correctly when viewed on the 2D platform of paper and digital documents. WorkingSpec works to compliment the 2D platform and enhance it through specific QR codes, placed on the detail drawing, product material or packaging. The app is used to scan the code and view the 3D-animated, interactive model on a Tablet or Smartphone. 1 – Download the WorkingSpec app from the Apple app store or Google Play. 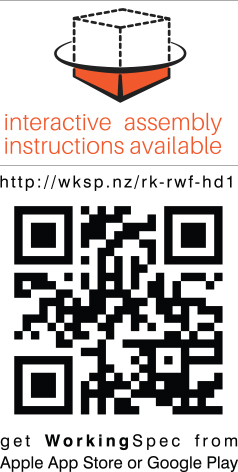 2 – Find and scan the WorkingSpec QR code on the participating Manufacturer’s brochure, drawing or packaging. 3 – View the interactive model.